President Donald Trump again leaned into a controversial issue that has ignited his base -- the case of "Empire" actor Jussie Smollett -- when he announced Thursday that the Department of Justice would review Smollett's case after conservatives decried a prosecutor's decision Tuesday to unexpectedly drop all charges against the actor, who was accused of staging a hate crime against himself in Chicago. 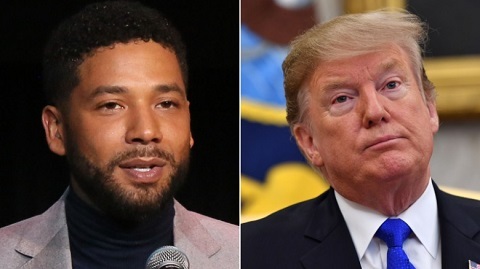 "FBI & DOJ to review the outrageous Jussie Smollett case in Chicago," Trump wrote on Twitter Thursday morning. "It is an embarrassment to our Nation!" The Department of Justice and the FBI declined to comment when asked about the President's tweet.